Former heavyweight world champion David Haye has ruled out retiring from the sport and is targeting a rematch with Tony Bellew. Haye, 36, had surgery on an Achilles injury sustained in Saturday's 11th-round defeat by Bellew in London. He suffered the injury in the sixth round of the fight, but says a two-and-a-half-hour operation "went well". "I live to fight another day and I will fight another day," Haye told Sky Sports. Asked if he would be returning to the ring, he said: "No doubt about it, I have never been more sure about it." He added: "Other athletes have come back in six to nine months after the same injury, I am in a good condition, a healthy-living person and I am looking forward to getting back in there." 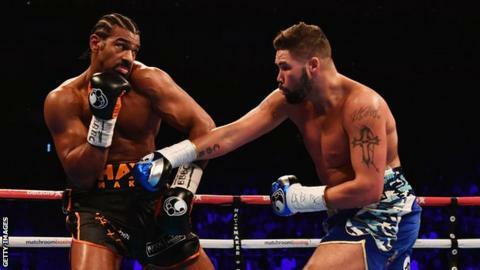 Bellew, 34, said he is considering retirement following his win, but admitted that an offer for one further fight could be too lucrative to turn down. Asked whether the Haye bout would be his last, Bellew told BBC Radio 5 live: "It's an option. It's something I'm thinking about." In response, Haye told Sky Sports: "I never envisaged losing this fight, if Tony Bellew does retire - and I truly hope he doesn't - then I will carry on in my path to be number one in the world. "But it is only fair to the fans to rematch against the guy who beat me. If that does not happen, then I will find a way to challenge for the heavyweight title. I believe after sharing a ring with him, he will want to do it again."